Wicking action to keep your feet dry - Great for all sports and fitness activities.Colored Coolmax Socks are a short ankle sock that is a perfect blend of style, comfort and performance. Color blocking makes them easy to coordinate with any apparel. Made with a mix of moisture wicking Coolmax(TM) to draw moisture away form the foot with knitted in ruggedness with nylon and spandex yarns for durability and excellent stretchy fit, these socks are a great addition to your fitness wardrobe. 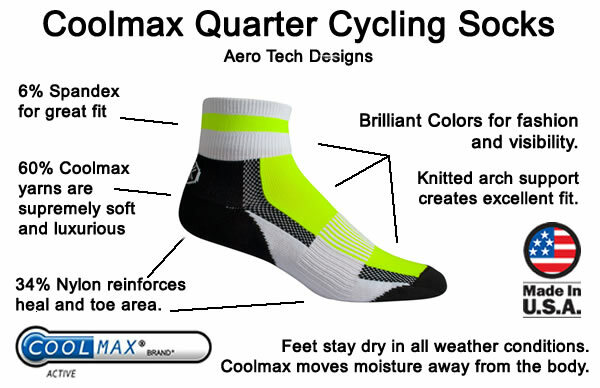 Also available Coolmax Sock in both solid black or solid white. Machine Wash, normal temperature, no bleach, tumble dry. CoolMax - by Invista, is a tetra - channel polyester, which pulls, or "wicks", moisture away from your skin to the outer layer of the fabric. 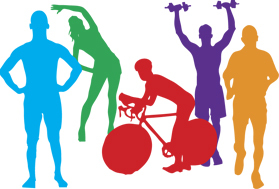 COOLMAX fabric enables the wearer to improve personal performance. It allows consumers to perform at their optimum for longer because it keeps bodies cool, dry and comfortable. As a result, the fabric can help improve focus and enhance endurance. Coolmax is the brand for high achievers who never settle for the regular polyester. It is used for high design and technically engineered clothing. COOLMAX fabric is a brand for consumers on the cutting edge. Close-up of four-channel fiber used in CoolMax fabric. 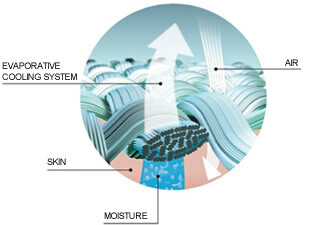 Channels speed moisture to outer surface of fabric. Very comfortable. Breathable and socks up moisture. Cool and comfortable. Well made. Color blocks add fun to a high quality. Love the softness and comfortable feel to these socks. Never thought I'd pay $7 for a pair of socks. They are some very nice socks. I was just thinking "well, I'll get the free shipping if I get the socks, so why not?" I will definitely be buying a few more pairs. They're well made and feel really good. Good, solid sock at reasonable price - made in USA (which is good, whether you realize it or not). Super comfy, nice fit, don't shrink, stay up and a great price. Got a couple of pairs for cycling, they are so comfortable I ordered 6 black pair to go to work in. Great socks, but they are really small for size XL. Based upon how small the XL is, I suggest you buy a size larger than you think you need. Very good quality product, nicely light and cool. Very comfortable to wear. Very comfortable socks. They fit great, look great, and the price was very reasonable. I'd buy again. I bike in a suburban/urban environment. Based upon my experience, the more high visibility you can work into what you wear the better. These socks are very comfortable. I bought another pair several years ago so I know they hold up well. I have been using a thinner sock and initially thought they might be be uncomfortable and make the shoe to tight. Not so. They fit well and are very comfortable. These sock have a nice cushion feel to them. I ride with sandals and clipless peddles and they work great. For the price you can't beat this sock. It's just as good as other brands "special bike socks" that cost 2 or 3 times as much. The only question I have is how long it last, but it seems to be well made and should be comparable to other synthetic fabric socks. Got these for cycling but now husband also wears for tennis. Loves them. They fit, wick away and look good. Hove used these for several years and have found them to be durable and a good value. Enough cushioning for just about any biking style. Excellent socks, comfortable, fit right, feel great on short or long rides. Great socks, I'm a size 12, I ordered large, fit is great. ATD is no Amazon, slow on shipping, the only reason I didn't give them 5 star. These are nice if you like thin socks. I have ordered several more pairs.